Datura is a tropical-looking plant with large, showy, fragrant white flowers. The entire plant is about 3-5 feet high and at least as wide. 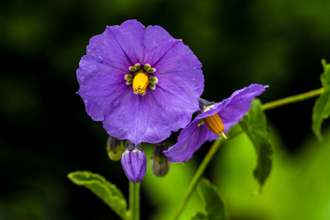 Flowers are tubular shaped and can be 10 inches long. Blooming of individual flowers occurs in the evening, with the flowers closing by the afternoon of the following day. As the flowers unfold, there is a point when they pop open and release a powerful fragrance. The fragrant blossoms attract hawk moths. After flowering a thorny, golfball-sized seed-pod forms. The foliage is gray-green, soft and hairy, with rubbery stems and leaves which are ovate and up to 5 inches long. While the flowers have a pleasant smell, the foliage has quite a different odor. Datura thrives in summer, and is commonly found along roadsides, in washes, or in other sandy places. It blooms from around March to November. Datura is a member of the Nightshade family (eggplant, tomato, potato, tobacco and so on). The flowers open at dusk and are usually closed by mid morning - one and done! Those hornworm caterpillars you see on tomatoes feed extensively on this plant as well and the resulting adult moths get nectar and lay their eggs on the leaves. Interesting trade-off - caterpillars eat leaves but the adults are necessary for survival of species. Datura has long been known to have poisonous and narcotic properties, and should not be ingested, inhaled, etc. in any fashion. Every now and then the unfortunate results of someone trying to use it appears in the news. Native people did use it for religious purposes, usually these were once-in-a-lifetime events. Several species under the Datura genus occur locally. Datura wrightii is a native and probably the most common species found here. The name Jimson Weed most specifically belongs to Datura stramonium, a non-native - the "Jimson" derives from "Jamestown", where in incident in the Virginia town lends historical significance. 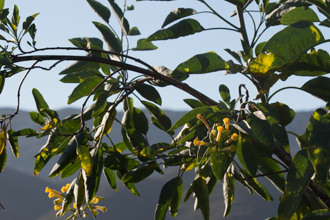 Probably due to its showy appearance, abundance, and intriguing poisonous properties, there is a lot of literature online about this plant, including descriptions of its different species, and its poisonous effects.